Living a Fit and Full Life: Go Old School with Handcrafted and Delicious Candy From Hammond's Candies! Go Old School with Handcrafted and Delicious Candy From Hammond's Candies! Hammond's Candies in Denver, CO has been handcrafting and twisting the finest every day and holiday confections for over 90 years. The company is world-famous for its oversized candy canes, beautifully spun ribbon candy, and stunning lollipops. Hammond’s still makes candy the old fashioned way, with the same tempting recipes and the same careful craftsmanship on which it was founded. Hammond’s is a niche confections company that has created an extremely versatile line of classic candy products. Beyond the above items, the company manufactures lollipops, holiday ribbon candy, filled straws, miniature pillows, marshmallow, caramel, toffee, wrapped and unwrapped bulk candies, and various milk, white, and dark chocolates. The company ships its products throughout the US, Canada, Europe, and even the Middle and Far East. Our carnival colors in our Round lollipops are fun for any occasion! These satiny handtwisted lollipops are a tasty nostalgic treat! Each lollipop is approximately 3 inches in diameter and is 2oz. in weight on an extra long stick. Hammond’s old-fashioned popcorn is popped to perfection and delightfully scrumptious! 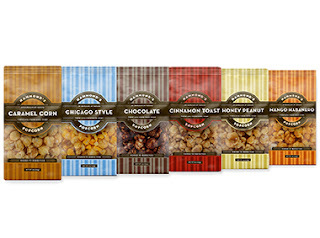 Caramel, chocolate, cinnamon, cheese, sweet and spicy, with nuts or pretzels—Hammond’s offers seven enticing varieties of delicious popcorn to satisfy any popcorn fanatic. 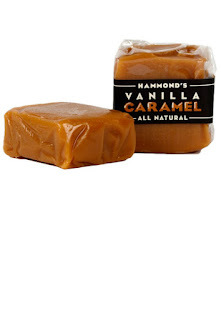 Our Hammond's Gourmet Caramels are generously sized to satisfy the most adoring of Caramel lovers! Each handmade piece is made the Old Fashioned Way-the result is a delicious soft & buttery Caramel. 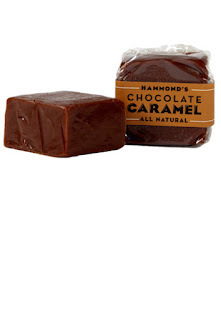 Our Hammond's Gourmet Caramels are generously sized to satisfy the most adoring of Chocolate Caramel lovers! Each handmade piece is made the Old Fashioned Way-the result is a delicious soft & buttery Chocolate Caramel. Not only a favorite among long-time Hammond’s customers but also of the Hammond’s President! Mitchell Sweets are handmade Marshmallow covered in Vanilla caramel. Can you think of anything dreamier? This is great for yourself or to give as a gift! Not only a favorite among long-time Hammond’s customers but also of the Hammond’s President! 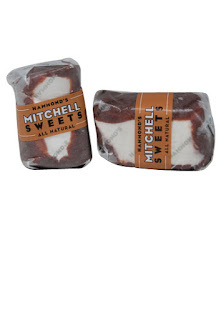 Chocolate Mitchell Sweets are handmade Marshmallow covered in Chocolate caramel. Can you think of anything dreamier? This is great for yourself or to give as a gift! are ready for all to adore with classic and creative American favorites. 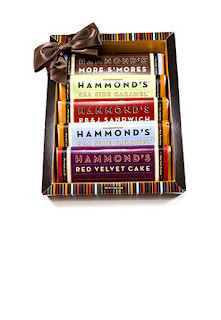 Each gift box is filled with a random assortment of Hammond’s award-winning chocolate. It’s time to sink your teeth into something delicious and sweet! Packed with colorful confetti sprinkles and bursting with big birthday cake flavor, let the celebrating begin! Like your coffee with a hint of chocolaty goodness? One bite will transport you to a Parisian corner café. Go old school with handcrafted and delicious candy from Hammond's Candies! 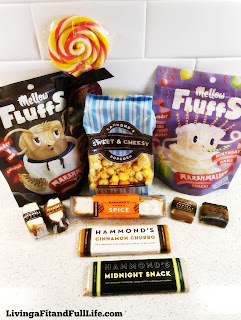 Hammond's Candies are some of the best candies around and I'm absolutely in love with all of their delicious candies that I had the pleasure of trying. 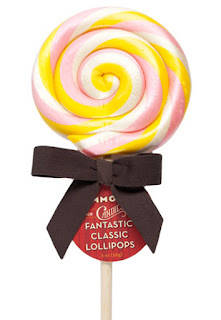 Hammond's Candies Lollipops are a dream come true for kids and taste absolutely incredible. Hammond’s old-fashioned popcorn is now one of my favorite popcorns ever. Not a single un-popped kernel was in the bag and the flavor was so good! And, if you love caramels, Hammond's Candies has some of the best around! They taste old fashioned yet have the perfect caramel flavor and texture. 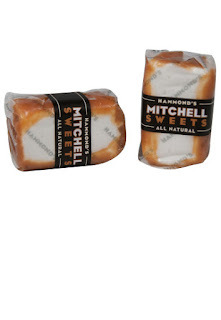 Hammond's Mitchell Sweets are some of my all time favorite candies, perhaps it's because it's a marshmallow covered in either chocolate caramel or caramel but they're incredibly delicious. Hammond’s chocolate bars are another favorite in my house. They're incredibly rich and delicious and are the perfect way to satisfy any chocolate craving! 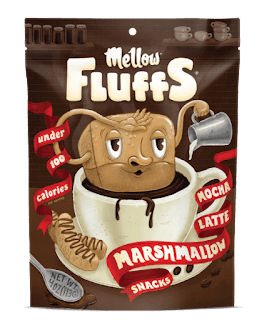 Hammond's Candies also makes Mellow Fluffs which are delicious flavored marshmallows that my family and I absolutely devoured. They're soft, full of flavor and make the perfect low calorie treat! If you love candy like I do you need to check out Hammond's Candies! They have an amazing selection of candies that are incredibly delicious! Click HERE to find a store near you that sells Hammond's Candies! Click HERE to learn more about Hammond's Candies! 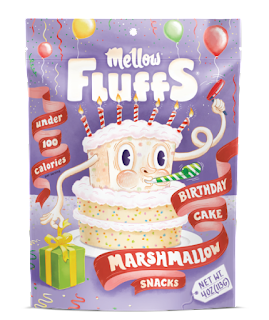 Click HERE to learn more about Mellow Fluffs! Follow Hammond's Candies on social media!